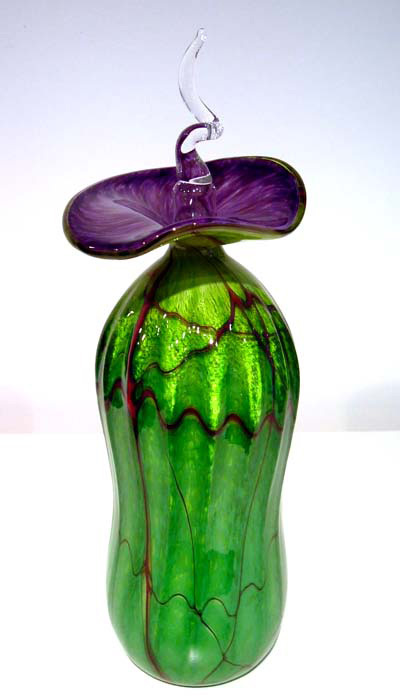 Roger graduated from Manchester Poly in 1975 with a BA(Hons) in 3D Design - Glass and Metal. 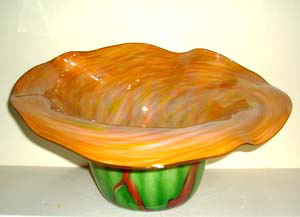 During the 80's he was chief maker for both Pauline Solven and Charlie Meaker until setting up Phoenix Hot Glass Studio in 1989. 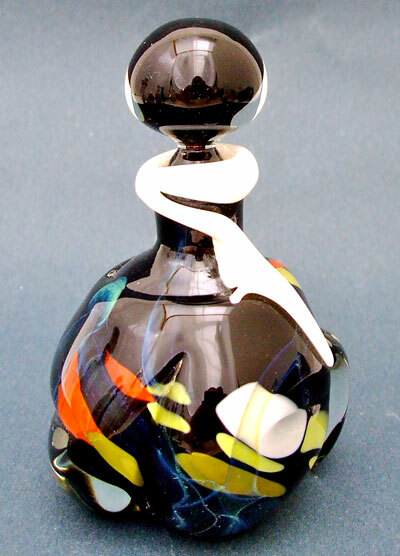 Phoenix enjoyed a great deal of success for 16 years making small batch production runs of Roger's designs for gift shops and craft galleries and specially commissioned corporate work for clients throughout the UK. 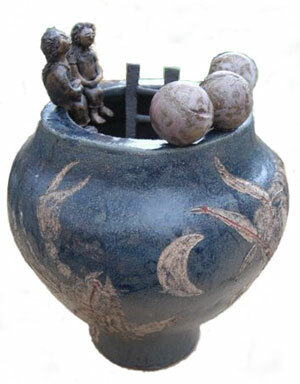 Phoenix closed in 2005 to allow Roger to concentrate his work on sculptural, installation pieces. His work continues to be technically challenging as befits a craftsman of his experience. 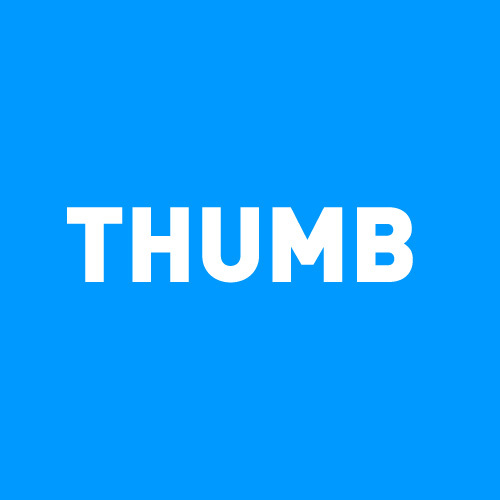 Click on the images to view larger versions. 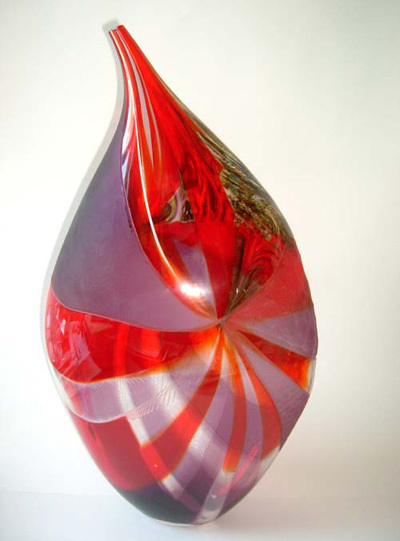 “Graduating from North Staffordshire Polytechnic with a Degree in Glass Design in 1988, I went on to work with a number of glass practitioners in the UK. I have exhibited work extensively in the UK, Europe, USA and Japan. 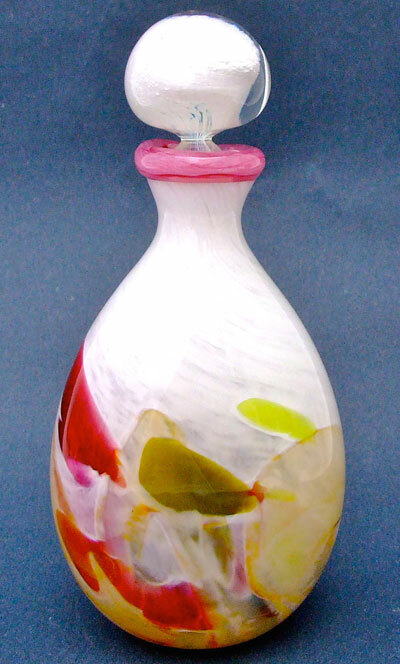 I have taught on a number of glass courses both in the UK and the USA, and teaching remains a passion for me. 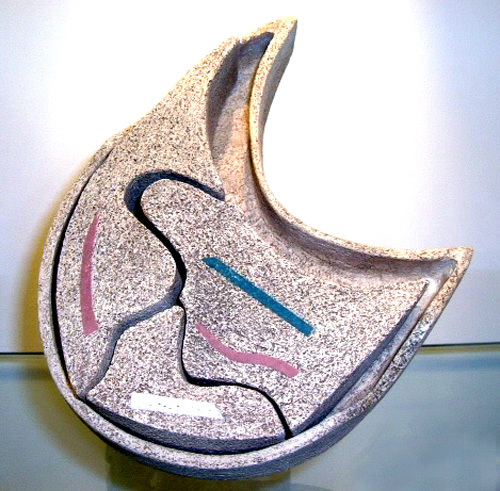 My work investigates the qualities of the material through a visual language of form, colour and surface. 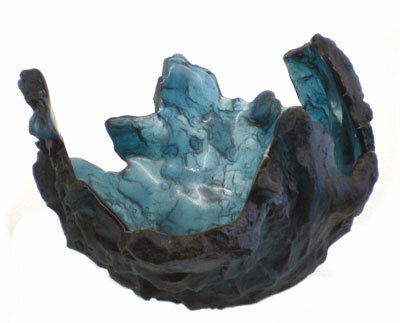 The objects I produce are tactile and sensual, exploring interior and exterior spaces". 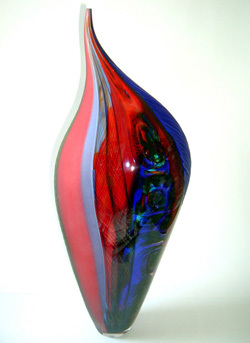 Louis Thompson currently works from The London Glassblowing workshop. Click on the images to view larger versions. 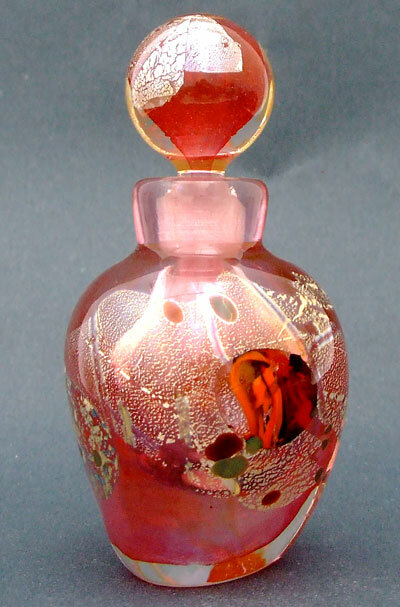 “It is indeed rare and unusual to find both Hot Glass manipulating and cold glass processing skills combined with such a strong design sense as they do in Allister Malcolm’s superb craftsmanship. 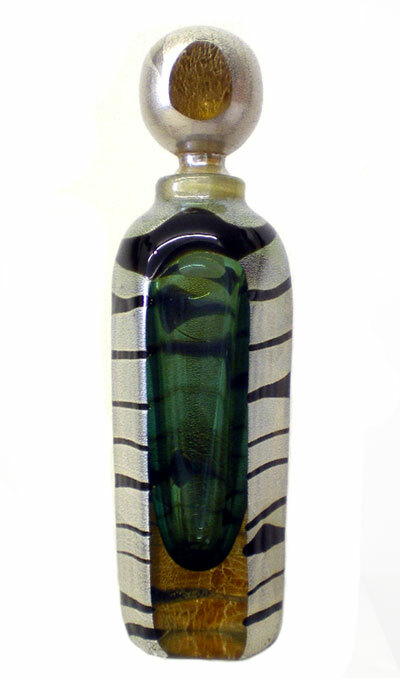 His studio is rapidly expanding as demand for his work grows. Commissions from discerning corporate and private clients in the USA, Europe and the Middle East provide evidence of Allister’s international acclaim.” Click on the images to view larger versions. 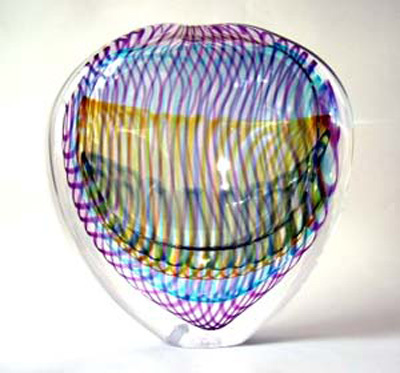 Siddy Langley is one of Britain’s leading glass artists. 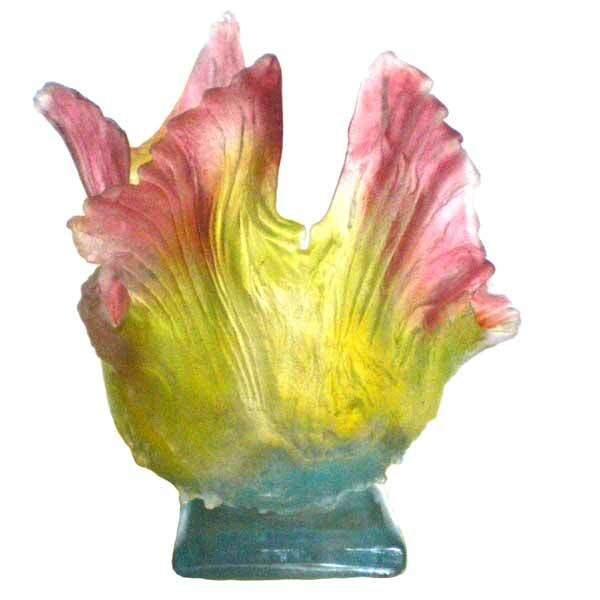 Working with molten glass gathered from the furnace and using precious metals such as gold, silver and tin, she applies the decoration before the glass is blown. 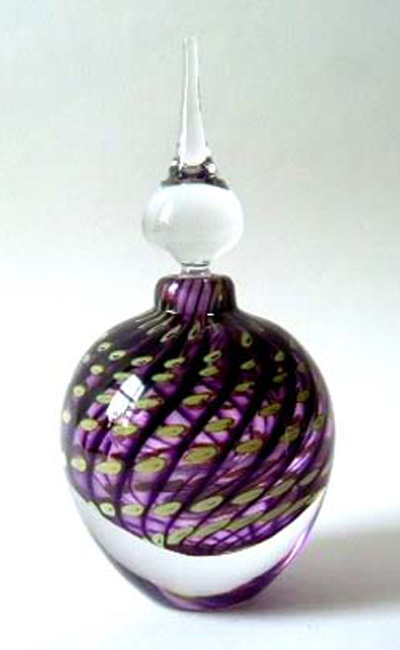 The design then grows with the piece to form the delicate and intricate patterns that characterise Siddy’s work. She fashions each individual piece by hand using a freeblowing technique that ensures that each signed and dated piece is unique. There have been six exhibitions of her work at Neville Pundole’s Gallery for whom she has designed and made exclusive Limited Editions. Click on the images to view larger versions. "For me the creative process has to do with living and absorbing the stimulations of each day, and through experience allowing these influences to permeate the work through the intuition. In both the living and the making the difficult secret is to be without prejudice, like a child, and like a child to enjoy playing with ideas and material......There seems little point in making the same thing twice so we don't and our customers appreciate owning something no one else has, often we make only a dozen or so pieces a day, each has its own character." Click on the images to view larger versions. 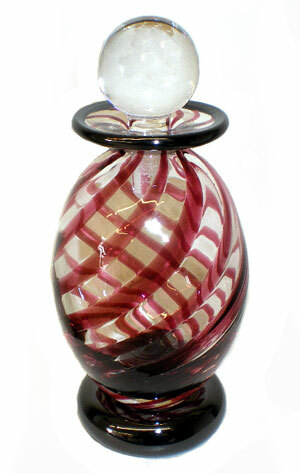 "From the incandescent magma, blown and forged by expert hands, the world famous and renowned Murano glass objects are born. 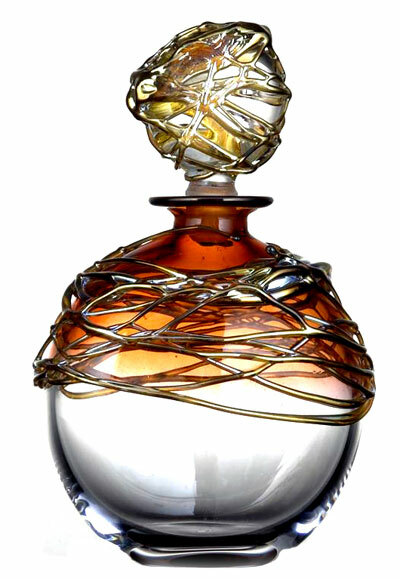 In the specific case of Afro, he uses an even more complex and difficult technique called "tociar piera" or "filigree". Afro prepares the rods of colored glass then lets them cool down slowly. He cuts them and begins to give them form by means of blowing and shaping..... 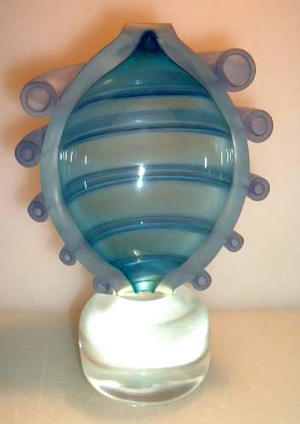 Even though he is considered a "youngster" in the world of glass blowing, Afro is quickly becoming recognized by international collectors for his technical ability and artistic expression." Click on the images to view larger versions. 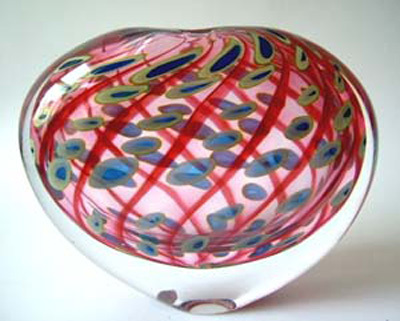 Ed Burke is a master glassblower; after gaining a degree in glass design, he worked for many established glassmakers before building his own furnace and studio and making his unique style of glassware. 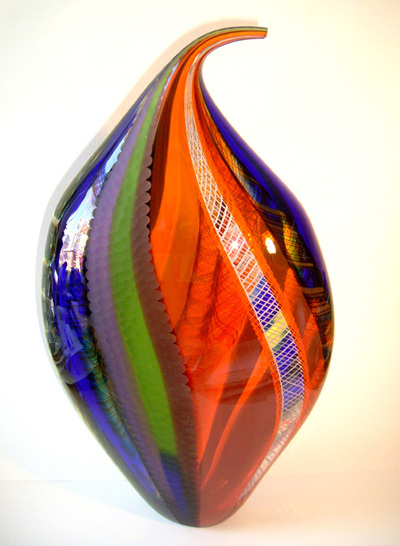 Ed's interests are in the use of strong colour and shape. 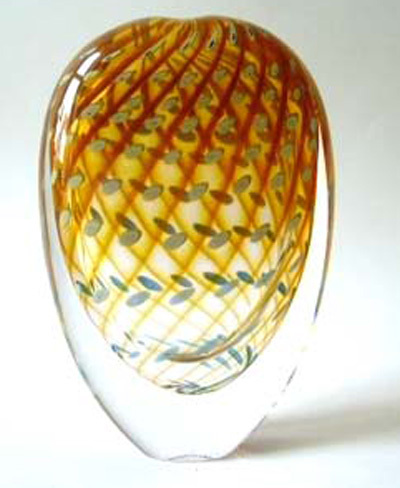 Margaret Burke specialises in the cold working of glass. 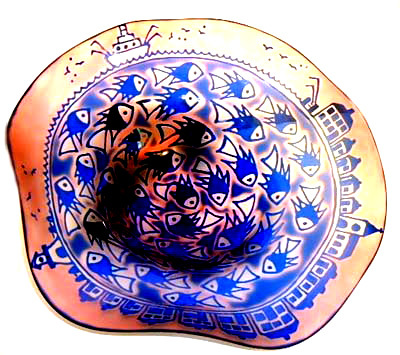 She designs and embellishes a range of plates, bowls and glasses. 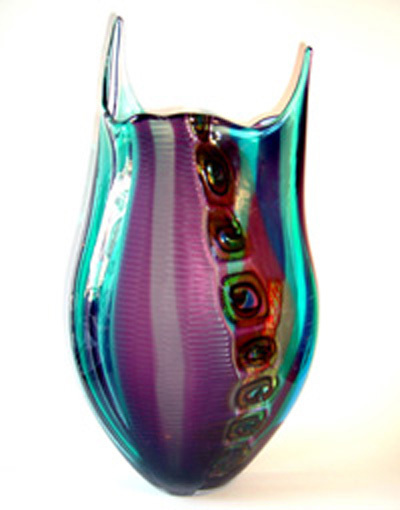 Primarily inspired by Primitive Art, she has developed the technique of etching through layers of coloured glass to create designs that are both contrasting and tactile. Click on the images to view larger versions. 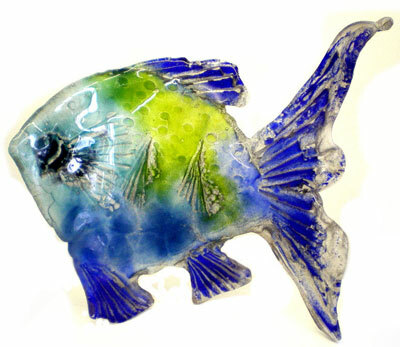 Amanda Brisbane is the UK’s foremost sand-cast glass artist. 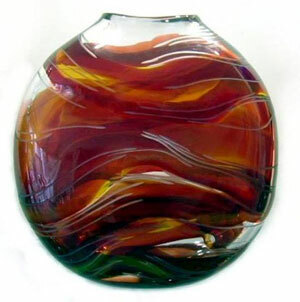 She embraces a technique in which she pours molten glass into her exuberant, spontaneous designs in the sand, creating a unique range of forms. 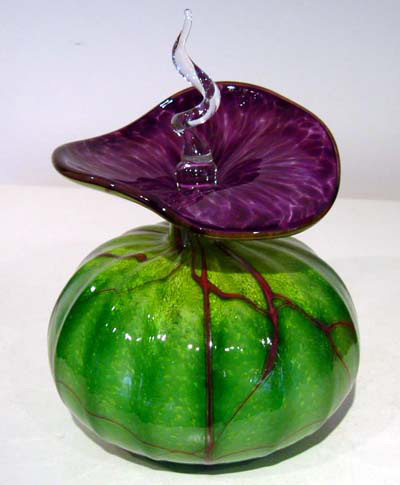 Her pieces are as organic as the casting technique she employs, giving her work a dynamic spontaneity and displaying the liquidity of glass at its best. Click on the images to view larger versions. All images, design and content copyright The Neville Pundole Gallery 2003 - 2008 or of their respective owners.